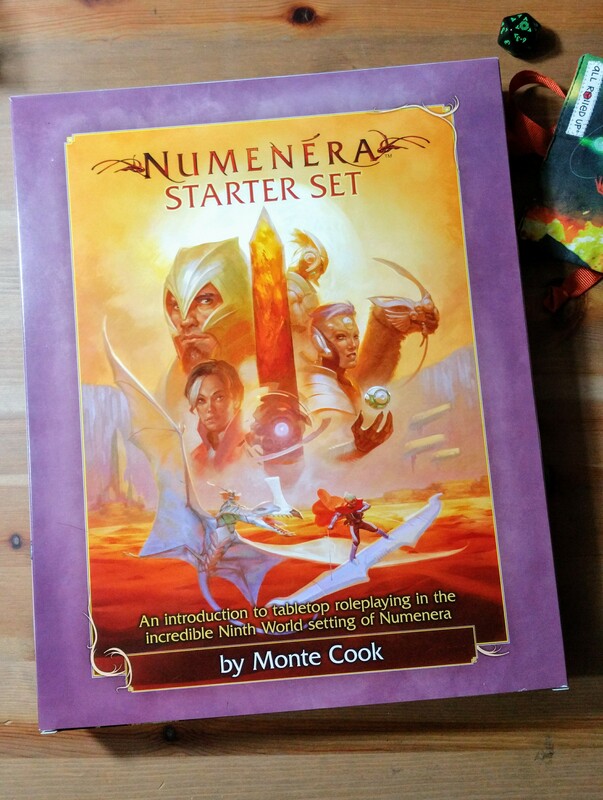 I don’t know how I missed it, but Monte Cook Games released a Numenera: Starter Set recently. I guess it must have been very late 2016 – December even? I only recently noticed it at Gameslore – and then on Facebook. Given that I just started running Numenera again earlier in the week, I thought I’d give it a look and see what it offered. I have run Numenera several times at conventions, large and small. I have found it easy to prep for and interesting to run. As I got a copy of the Reliquary Box Set from an earlier Kickstarter, I have some extra table bling like maps and play mats. I find it makes it easier to engage new players with a game and setting if they have something really tactile and colourful in front of them. A character sheet will usually do; if you can throw out a big glossy map or something, even better. However, core book Numenera can be a tough sell off the back of a demo. £40 – £50 for a 400+ page hardback book – that can feel like a steep price and a steeper learning curve. Mostly the former, because I find Numenera pretty easy to sell as a simple and intuitive game – and that the core book comes rammed with options and a meaty lump of setting. On top of that, Monte Cook, Bruce Cordell and Shanna Germain cooked up a fine platter of cheap and accessible Numenera support material – much of which I have reviewed in the past on Geek Native. Anyway – I got the box today, so I thought I’d do a quick box opening video to show you what you get. I can see the box aims at the same market as Fantasy Flight’s beginner sets for Star Wars, providing the essential game mechanics and an adventure with a map and pre-generated characters. An adventure bundled in a box. I think that a Star Wars beginner box perhaps has slightly more content – like card chits and those fancy dice. However, the simplicity of Numenera and the cheap Glimmer PDFs that provide more material mean that you could run a few adventures with a minimal of additional cash outlay. Indeed, if you dive into the fan communities on the Web, you could glean enough new material for adventures without spending another penny. I’ll do a proper review when I have had the chance to look through the content of the box properly, especially the sections supporting the player and GM understanding of what to do with all this cool stuff!